In 24 hours, the Trojans gave the #5 (Highlands) & #6 (Knoch) ranked 4A WPIAL powerhouses all they could handle to respectively share the 4A Section title. The physical, fast-paced 32 minutes of basketball saw Highlands earn a 57-46 win over the Trojans. 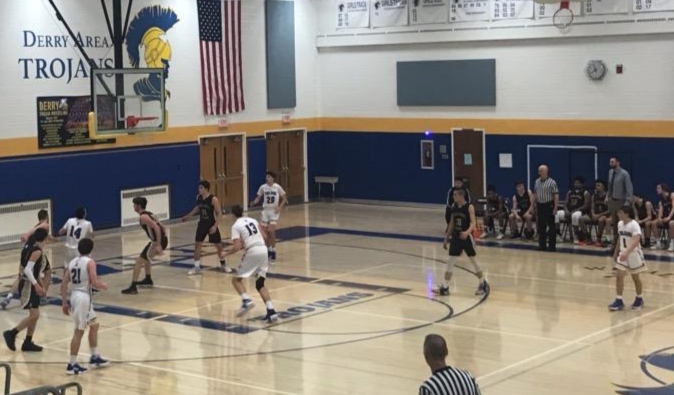 The Trojans benefited from relentless team defense led by Justin Huss. John Kerr led the Trojans with 16 points & 4 blocked shots. Aidan & Ryan Bushey each scored 8 points and Justin Huss & Tanner Nicely (4 assists) netted 7 apiece. Derry finishes the regular season with a 12-7 overall record which is among the top seven WPIAL 4A playoff teams. The Trojans will await their 1st round playoff opponent which will be announced on Tuesday February 12th at the Greentree Marriott. The third place Trojans will be among one of twelve teams in the class 4A playoffs – the top 4 teams are projected to earn a first round bye.